Hello once again Empire Avenue Community! Nick the Intern here, and today I have a few thoughts about Communities on Empire Avenue. 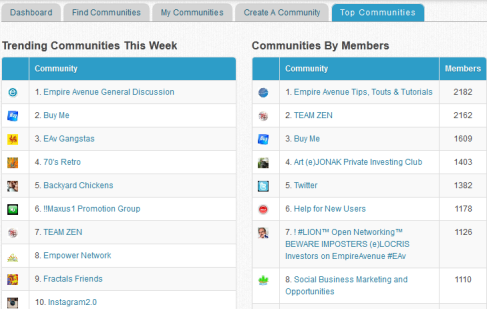 Communities are a great way to begin your Empire Avenue journey, and their value only increases as you spend more time on Empire Avenue, so I thought I would talk about the advantages of Communities for those first starting on Empire Avenue, and the advantages for those who are a little more seasoned. For a beginner, Communities can be a great way to start connecting with other Community members. When trying to find viable networking opportunities, knowing the types of interests and goals held by other people is helpful in attempting to build a meaningful network, and Communities are where members wear their interests and goals on their sleeves! Similarly to Missions, you can scroll through the various Communities at your own pace, or you can use the search bar and hone in on the exact type of Community you are after. There are many active Communities on Empire Avenue, and it’s just a matter of finding the ones that you want to be a part of! For you more seasoned members Communities can be utilized not only as a networking booster, but also as an opportunity to interact with your current network. If your network is strong you can feasibly create a Community specifically for your network, and use it to easily communicate your various Empire Avenue activities (such as your current Missions). Whether you are a Fresh Faced member, an Empire Avenue “Master” or somewhere in between, the power of Communities is undeniable. If you are looking to build your network, or even just want to kick back and discuss Backyard Chickens with the wonderful people of Empire Avenue, you need look no further than the Communities section. Feel free to leave comments below about some of your favorite Communities, and how being a part of one has helped to improve your Empire Avenue experience. If you want to communicate directly with the Empire Avenue staff, join the Empire Avenue General Discussion Community, we wear Empire Avenue proudly on our sleeves in there!